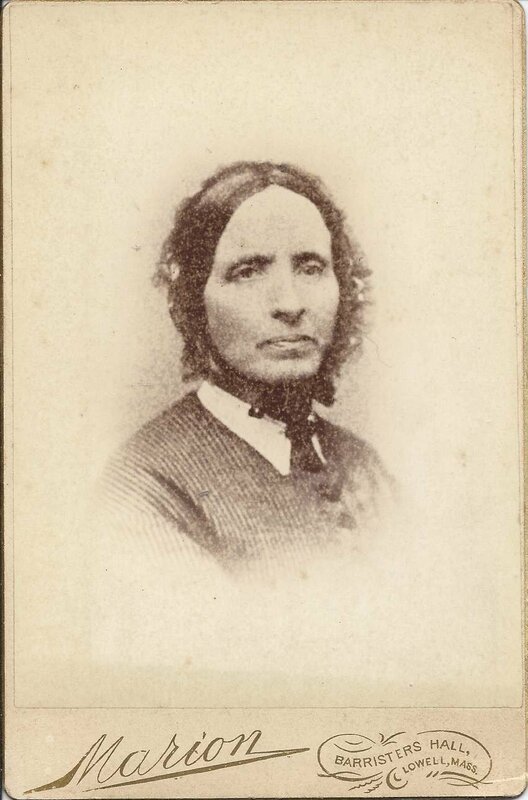 Photograph of an older woman identified on reverse as the wife of Benjamin Walker. The photograph was taken by the Marion studio of Barristers Hall, Lowell, Massachusetts. The identification reads: Mrs. Mary Osgood, wife of Benjamin Walker. Researching online, I found a Benjamin Walker of Lowell, Massachusetts with a wife named Mary. She was, possibly, Mary Elizabeth Bryant, daughter of William and Mary (Cline) Bryant, born at Stoneham, Massachusetts on October 16, 1829. As for the Osgood, I'm not sure. I know there were Osgoods in Stoneham, Massachusetts, and it's possible that Mary descended from an Osgood and was given Osgood as an additional middle name. Or perhaps she had a brief marriage to a Mr. Osgood. Mary Elizabeth Bryant was first married to Benjamin Franklin Rix, who was born at Littleton, New Hampshire, on 28 July 1815. He and Mary married on 23 March 1848. They joined the "Father Kemp's Old Folks", as traveling singers. After their son Frank Reader Rix, born 30 August 1853, at Lowell, Massachusetts, grew old enough to attend school, Mary ceased her travels and began singing at St. Ann's Church. Mary and Benjamin Franklin Rix divorced. Later, on 25 December 1876, Mary married Benjamin Walker, who was the organist at St. Ann's. Benjamin Walker was born at Wilmington, Massachusetts, on June 24, 1822. He had a varied career: studied law at Cincinnati; published books in Philadelphia; taught penmanship at Lowell, Massachusetts; served as paymaster at Hamilton Print Works; as director of the Lowell Mutual Fire Insurance Company and the Lowell and Andover Railroad Company; and held various civil and social positions at Lowell. Benjamin was first married, on October 27, 1842, to Catherine Kimball Gillis, daughter of Josiah and Mary (Stark) Gillis of Wilmington, Massachusetts. They had a daughter, Mary Catherine Walker, born December 20, 1857. Catherine Kimball (Gillis) Walker died on November 6, 1874 at Wilmington, Massachusetts. Read more about the life of Benjamin Walker here, in the January 1904 issue of the Contributions to the Old Residents' Historical Association. 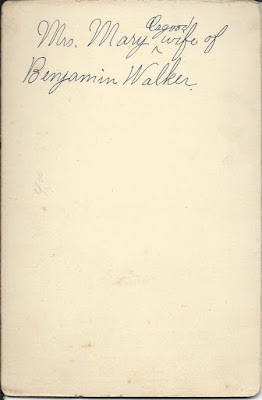 Benjamin Walker died November 11, 1896 at Lowell, Massachusetts. Mary Elizabeth (Bryant) Rix Walker died April 29, 1907, also at Lowell. If you have an alternative theory of the identity of the woman pictured above, or if you can verify that she is truly Mary Elizabeth (Bryant) Rix Walker, please leave a comment or contact me directly.